Traditionally, guitars require two hands to play, but the Kellycaster offers the possibility of playing with a single finger. 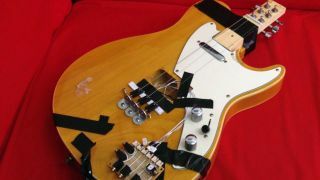 Boasting a standard T-style guitar body with adapted neck and real strings, the Kellycaster was designed for musician John Kelly - who is unable to use his left hand - by charity Drake Music. Thanks to the work of coder Charles Matthews, the guitar links up to a computer - guitarists can then press pre-programmed buttons to play the chords and notes they want to hear. The computer measures how hard the guitarist is strumming, and reproduces the sound accordingly. £10,000 is the estimated cost of the guitar, but the charity hopes to make the blueprint available to adapt to different needs. Speaking to the BBC, Drake Music's Gawain Hewitt says: "I anticipate that it will have a very profound impact in terms of inspiring disabled people to be musicians, and the ambition would be that the computer would sit within the guitar body, rather than connected to it."